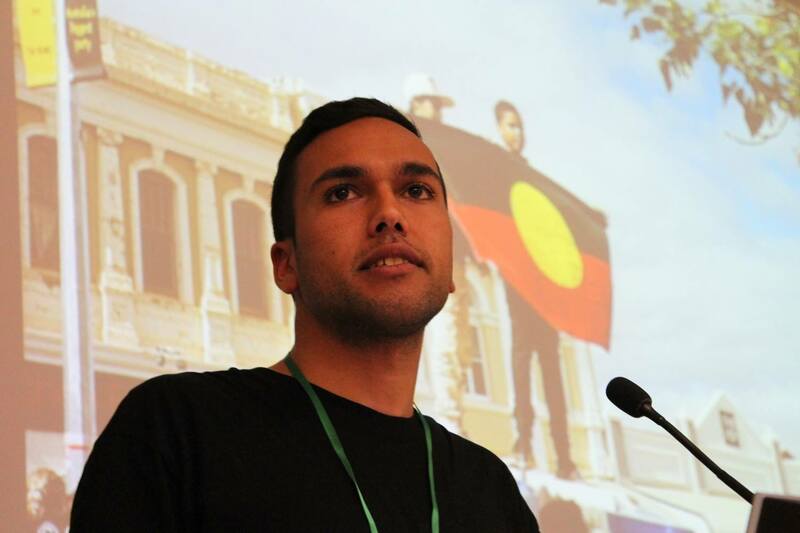 ‘No matter the odds, no matter the size of the foe, we resist.’ So said Indigenous socialist Gavin Stanbrook on the opening night of Socialism 2018, billed as ‘Sydney’s largest left-wing conference’. Stanbrook was referring to the heroic and desperate standoff by asylum seekers incarcerated in Manus Island detention centre last year, before local police, backed up by the Australian Border Force, raided the camp and destroyed it. 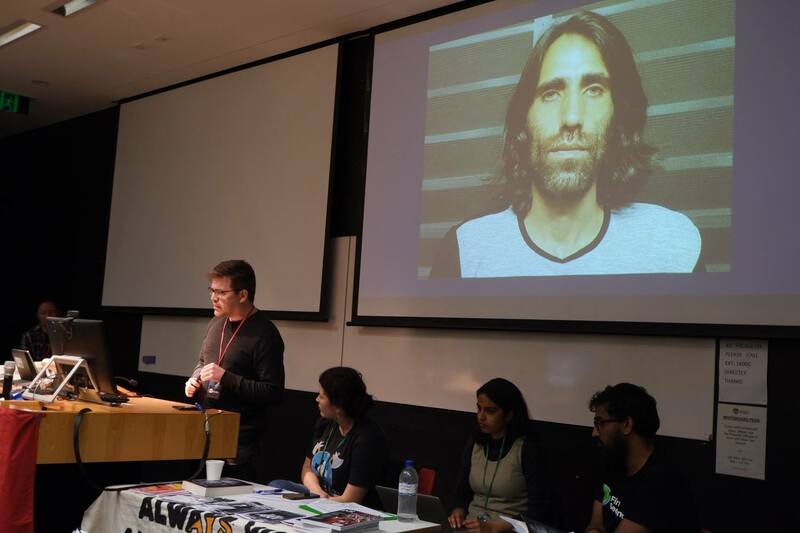 His tribute was a pointed one: Behrouz Boochani, the Kurdish Iranian journalist who has been imprisoned on Manus for five years, and who was targeted and arrested during the raid, was also a ‘guest’ at the conference – giving a talk via phone on Sunday. But Stanbrook was by extension also invoking the resistance of his own people to the Australian state’s ongoing colonial project, and the resistance of Palestinians against Israeli apartheid. Both were dominant topics at the conference. For Stanbrook and for socialists worldwide, those struggles and many others are connected, and they have a common enemy. ‘Racism is built into the very structures of the capitalist system,’ Stanbrook observed. In her speech the same night, union organiser Simone White referred to an old Builders Labourers Federation slogan: ‘Never Powerless.’ The workers who create all wealth are never powerless. The oppressed – whether their oppression is economic, racial, or based on their gender, religion or sexuality – are never powerless. It was a fitting informal slogan for the conference and for the movement underpinning it. We are confronted by vast and often terrifying problems, from historic economic inequality and the resurgence of fascism to a changing climate that could render most of our planet uninhabitable in a century. Socialists maintain these problems are connected – are, in fact, spawned and driven by the capitalist system – and that they are not insurmountable. Rather, they believe such problems can be overcome through collective struggle and solidarity. That we should not give in to nihilism or despair, because we are never powerless. The internationalist outlook of the conference was embodied in guest Dana Blanchard, from the Chicago branch of the International Socialist Organization and Haymarket Books. Blanchard was charged with reporting from the frontlines of Trump’s America – epicentre of global capitalism, deeply fractured political and cultural battleground. ‘Greetings from the belly of the beast,’ she joked grimly at the start of her speech on opening night. And there was keen interest in Blanchard’s take on the incessant political tumult stateside during several talks over the weekend, where she discussed the fightback against the Trump administration’s cruel austerity programs and cruel treatment of immigrants and refugees. As more than one conference speaker pointed out, more people, especially young people, are interested in socialism than have been in generations. Polls show today’s youth are fed up with capitalism and that 58 per cent of Australian millennials favour socialism. Another oft-cited metric is the explosive growth of the Democratic Socialists of America, which has now reached a membership of 50,000. A jaw-dropping 40,000 or more are new, having enrolled since the election of Donald Trump. The vast majority are under 35. One icon of this leftist groundswell has been beloved senator Bernie Sanders, whose dogged campaigning against the 1 per cent has been credited with making it okay to use ‘socialism’ in the mainstream for the first time in decades. But recently, the 27-year-old DSA-affiliated New York congressional candidate Alexandria Ocasio-Cortez has become the young face of the movement, after winning against an establishment Democrat in a local primary. The way Ocasio-Cortez became nationally popular overnight and sparked a firestorm of debate about socialism in the mainstream media without even being elected is very telling of the national mood. A similar youthful leftist upsurge has buoyed Jeremy Corbyn in the UK. What it adds up to remains to be seen. A lot of people mean a lot of different things when they call themselves ‘socialists’. Nevertheless, the desire for a new kind of progressive society is apparent on a large scale, waiting to be tapped into. Socialism, the conference, is organised each year by Socialist Alternative, Australia’s revolutionary socialist party (which closely shares a political tendency with Blanchard’s ISO). It’s a sister conference to the older and bigger Marxism conference, which takes place in Melbourne every Easter weekend. 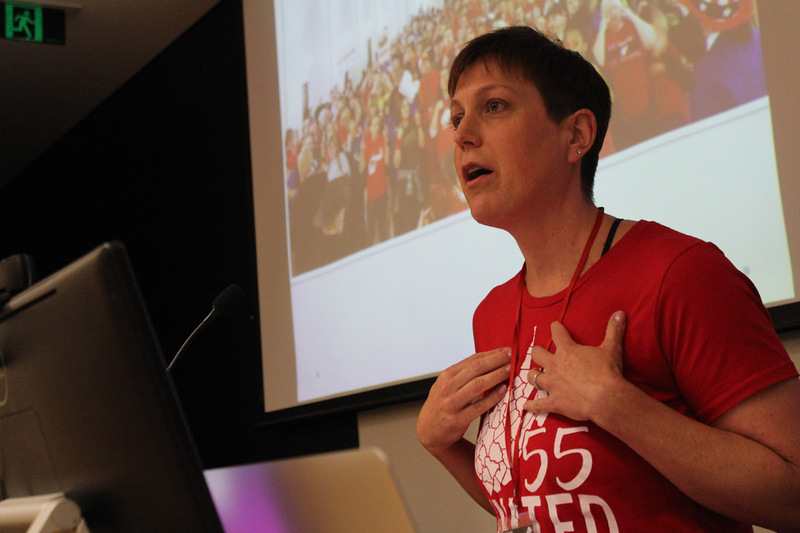 This year’s Sydney conference brought 550 people to 30 sessions across the weekend at the University of Sydney. This was the conference’s fourth edition, and the third time it’s pulled in more than 500 people. 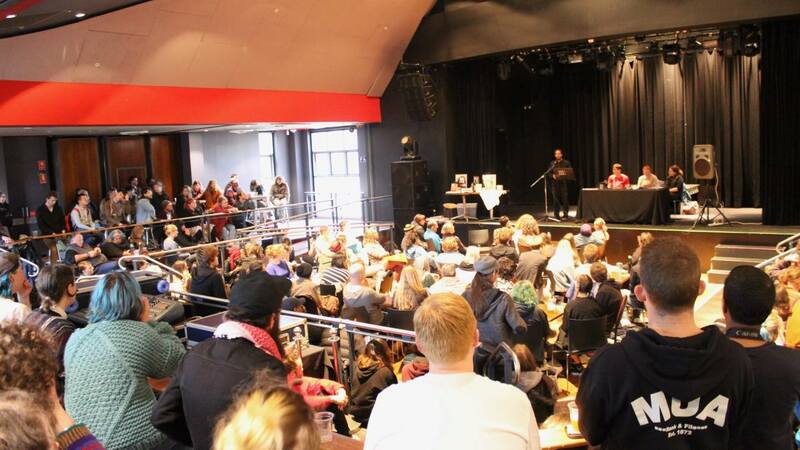 Attendees were a mix of young and old(er), newbies and veterans, the fired-up and the merely curious, committed Marxists and activists on other paths – Aboriginal, Palestinian and Tamil rights activists, trade unionists, Greens. Quite a few travelled from around Australia to attend. A large Melbourne contingent sported black t-shirts featuring the logo of the Victorian Socialists, a new parliamentary party formed with the aim of putting a socialist in the state parliament in November. Some sessions at the conference were focused on Marxist theory and history, with sessions ranging from a 101 intro to the Russian Revolution to deeper topics like Marx’s philosophy of dialectics. Others tackled particular epochs in history or localised struggles (Stalinism in North Korea, the Civil Rights movement in the US), while retaining a solid Marxist perspective. The conference was unabashedly partisan, and the agenda was revolution. Again and again over the weekend, speakers disavowed electoral politics (at least in the capitalist parties such as the Democrats and the ALP – Victorian Socialists’ project in one winnable electorate notwithstanding). Instead they argued in favour of popular movements to force change from below. As White put it: ‘Asking nicely doesn’t work.’ Examples from Australian history were frequently cited over the weekend: the Green Bans of the 1970s, the Aboriginal Tent Embassy, the massive protests that won marriage equality for Australians. In many cases, socialists were instrumental in inspiring or guiding the fight. Blanchard also spoke compellingly of this dynamic at work in the recent wave of teachers’ strikes in the US – many taking place in the ‘reddest’ states and forcing Republican state governments to the bargaining table against their will despite draconian anti-union laws. But while the conference is characterised by a specific revolutionary program, its coverage of radical history and politics is thorough and enlivening, and there’s generous time for discussion and debate. Revolutionary socialists get a rap for being stubborn if not fanatical. In general, I find that Socialist Alternative and ISO members are friendly or even enthusiastic about airing other views and tendencies, and very practical about engaging in solidarity with other leftists, while patiently explaining their case for mass struggle, class consciousness and revolutionary change. For example, the DSA’s stunning growth was a topic of conversation during and after sessions throughout the weekend. (To be fair, my American accent naturally draws me into such discussions.) The largely reformist DSA and the revolutionary ISO have fundamental political differences, but they often work together on local campaigns in the States. And the sheer size and visibility of the DSA can’t be ignored – it’s an encouraging sign. The question of how or whether the DSA’s attempts to reform the capitalist system via the ballot box will actually benefit workers and the oppressed – especially given its recurrent strategy of working within the hated Democratic Party – led to lively and critical debate. 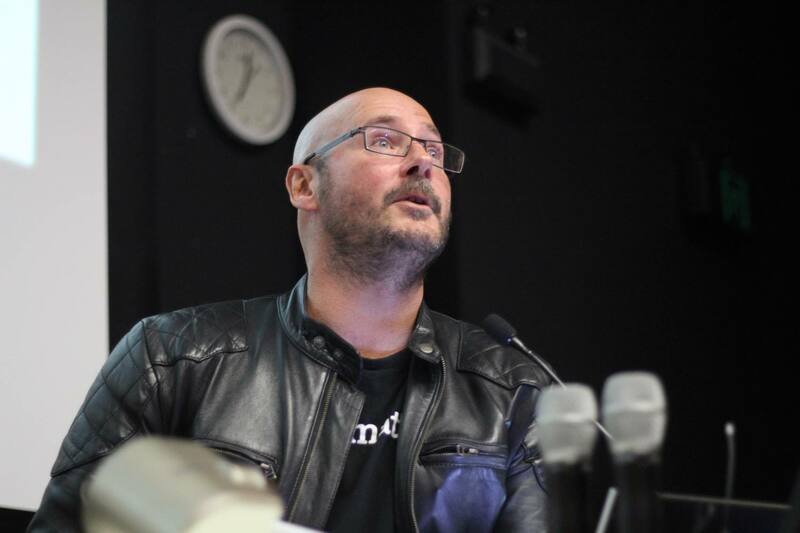 The conference also accommodated speakers who didn’t have a particularly Marxist agenda – such as Chris Graham, New Matilda owner and editor and perennial agitator, who spoke on opening night. Graham was there to talk about his experience aboard this year’s Gaza Freedom Flotilla, an annual action in which activists attempt to break Israel’s blockade of Gaza by boat. The flotilla was seized and boarded in international waters by Israeli forces in July, and Graham was arrested. He told unnerving stories of how the crew of the boat he was on were beaten by IDF soldiers, and activist passengers tasered – then recommended we take part in the flotilla one day if we’re able. The two sessions I attended Sunday were both unexpectedly emotional, and here I feel the need to get more personal in order to illustrate what’s at stake and why socialists fight. The first talk, by Behrouz Boochani, was entitled ‘Borders versus humanity: The war on refugees’, and it was one of the more harrowing experiences I’ve had in such a setting. Boochani spoke by phone from Manus Island. The room was packed to hear the voice of someone who is at once in the most desperate situation imaginable, witnessing and suffering relentless brutality, and who is also a leader and icon of the resistance against Australia’s border regime. Boochani gave a ten-minute talk and then took some questions. He mentioned the horrible and dehumanising conditions for asylum seekers on the island, including yet another suicide attempt a couple of days before, and the pain of fathers separated from their children on Father’s Day – with many of those children similarly incarcerated and brutalised on Nauru. As the disembodied voice filled the room, marked by an uncanny combination of resignation, anger, despair and resolve, I found myself feeling suddenly and unexpectedly distressed. Sunday’s talk gave me vivid flashbacks to those feelings. Without warning the physical sensations of grief overcame me: I felt an ache stab my throat and had to hold my breath to keep from sobbing. I lowered my head, tried to focus on taking notes. Then I realised quite a few others in the room were going through the same thing. I looked up and saw many reddened eyes and lowered heads; I heard sobs; it became very quiet and stuffy in the room as everyone held their breath. A couple of people got up and left. The spontaneous shared feeling in the room, a kind of emotional solidarity, was as striking as it was uncomfortable. ‘When I’m fighting, when I’m writing, I feel human,’ Boochani said. ‘We are human,’ he repeated. It was bone-chilling to hear. Imagine being in the position of having to affirm your own humanity so forcefully. Boochani also touched on his ‘Manus Prison Theory,’ which he sets out in his new book, No Friend but the Mountains: Writing from Manus Prison. (He wrote the 375-page book via text.) Boochani argues that the situation on Manus is just a more intensified version of what’s happening to most of us in Australian society, via government attacks on healthcare, housing, wages and civil rights – what he calls ‘soft torture’. It’s such an insightful and compassionate perspective from someone caged in this brutal and racist system, when he has every reason to give up on his fellow humans. ‘I am watching Australia from this island,’ he told us. Boochani is a remarkable and brilliant person, and his courage is inspiring – you want to resist this system if for no other reason than for him – but there’s nothing happy about that. His courage is just a means of survival, and many of his fellow detainees have given up. He maintains his struggle with vision and clarity, but with despair so deep it can’t be fathomed. This is perhaps the dark side of ‘Never Powerless’. Next up was Blanchard’s session about the teachers’ strikewave, which started in West Virginia. (Blanchard travelled to West Virginia to cover the strike for her organisation’s newspaper, Socialist Worker.) One of the poorest states in the nation and the very heart of ‘Trump Country’, it’s maybe the last place anyone expected a mass uprising to kick off. But significantly, it’s also Coal Country and the site of some of the fiercest labour battles in US history. In February, thirty thousand West Virginia public school teachers walked off the job statewide – illegally – in protest of appalling austerity and working conditions, demanding a pay rise directly from the Republican-controlled state legislature. For nine days they picketed and occupied the state capitol, their ranks overwhelmingly made up of women, their huge crowds a sea of ‘Red for Ed’ as they boisterously transformed John Denver’s ‘Take Me Home, Country Roads’ into a labour anthem. Some of them wore red bandanas, invoking the militant ‘redneck’ coal miners who banded together in their thousands and fought the US army in 1921. The teachers won the support of the vast majority of the state’s largely conservative residents, and forced the legislature to not only meet their demands but to give all public employees a pay rise. Their courage and self-determination, and their victory in the face of long odds, was greeted with an outpouring of joy and solidarity throughout the international left (though, predictably, it was all but ignored by a liberal media obsessed with Trump’s tweets and Russiagate). And it was infectious: the wave of strikes they set off in other states hasn’t ended yet. Blanchard argued that workers in some of the most abandoned regions in the country discovering their power in this way has established a template for successful mass struggle and resistance to Trumpism. Listening to her, I got a powerful sense that whenever the revolution comes, whether it’s five or fifty years from now, it will look something like West Virginia, only on a vast scale. It won’t be engineered by benevolent progressive politicians; it won’t be led by a band of masked militants. It will come seemingly out of nowhere, and it will be led by teachers or nurses or truck drivers who’ve simply had enough, and decide to shut things down. My parents and my sister and her family live in West Virginia, and I once lived there myself. And my sister is a teacher. By coincidence, she got a job as a substitute teacher just a few days before the strike began. She’s not in a union yet, but she and all my family supported the strike as it was absolutely in her interests. Being off work so soon after getting a new job with three kids to feed was no joke for her. She posted a video in support of the strike with the help of her youngest and I was proud. So the strike was very close to home for me, and it was eerie and incredible to observe it from here in faraway Sydney; to see a place I know so well become an epicentre of struggle. The strike’s ability to unravel the grip of Trumpism on the region was particularly thrilling and poignant to me. Many teachers and their supporters would have been Trump voters, but the strike positioned them against the establishment in a refreshing way that belied the frequently classist ‘red state/blue state’ paradigm. Each day’s developments during the strike amazed me more and more, and it was wonderful to see the interest it stirred in comrades here in Australia and around the world. All of these thoughts and feelings swirled through my head again during Blanchard’s talk. The talk ended and it was time for discussion. Other people in the room gave their perspectives one by one, all describing how amazed and inspired they were by the strike. I was moved to speak and relate my family’s story, but I was hesitant and nervous, my heart racing. I’ve never been very assured when speaking during such interventions, and I was afraid emotion would overcome me. Finally I decided the people present would want to hear this. I raised my hand, was called on, started out by saying that my sister is a West Virginia teacher … and felt the room go quiet. I did my best to get through it all in my allotted three minutes. I only almost broke down once, when I was talking about poverty in West Virginia, describing the time I volunteered with my dad to distribute toys to the needy over Christmas – how taken aback I was by the sight of the long queue of hundreds of parents, ashamed to ask for a handout but also desperate. The memory of those parents is why the strike made so much sense to me: why the teachers who couldn’t afford to live on their salaries were angry, why some of them volunteered to make sandwiches every day during the strike for the schoolkids who they knew wouldn’t get lunch if they weren’t in school. When I was done, to my surprise, the room applauded, more out of solidarity than my flustered rambling, I hope. Afterwards, Blanchard, whom I’d never met, came up to me and gave me a hug. She told me that she, too, had been fighting back tears hearing what I had to say, and told me that her experiences on the ground during the strike had reminded her of the humanity at the heart of these movements. A short time later, at the conference’s closing plenary, hundreds of attendees united their voices to sing ‘The Internationale’ over their beer. Between the talk with Bouchani and my reflections on West Virginia, it had been a wrenching day for me, and the passion in the room struck an unusual chord with me in that moment. It occurred to me that this might be personal for everyone there, just as it was for me. Socialists are ridiculed and dismissed in a number of ways. They’re portrayed as strident, unrealistic, unreasonable. They’re considered adrift in arcane theory, or blindly wistful for some sort of dehumanised totalitarianism. But on Sunday it occurred to me that socialists are more human and down-to-earth and compassionate than they’re given credit for. 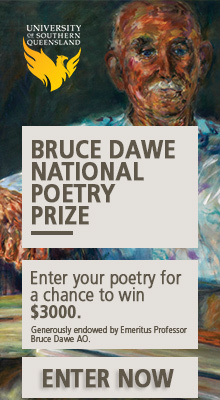 Those subjective and very human feelings of grief, joy, fear and, yes, outrage – whether from being refugees or meeting them, whether fighting for your rights as Indigenous Australians or seeing your family and friends in the U.S. scrape by on low wages and extortionate healthcare – are what make us imagine a better world. And that shared humanity is what brings us together in solidarity to strive to make that world possible. It’s why we’re never powerless. Jim Poe is a writer, editor and DJ based in Sydney. He contributes to The Guardian, inthemix, Junkee, SBS and Red Bull Music and hosts Classic Album Sundays Sydney. He tweets from @fivegrand1. A wonderful article especially about the report from Manus Island. I was there too, with red eyes, hanging my head in sadness. I am really moved by this report. Thank you for your powerful writing.